"Sampath Speaking" - the thoughts of an Insurer from Thiruvallikkeni: WC Policy ~ is Mahout a workman and what constitutes work place !! WC Policy ~ is Mahout a workman and what constitutes work place !! I love elephants ! I simply adored ‘Azhwan’ the affable elephant at Thiruvallikkeni. The passing away of the gentle giant in 1977 (14th Feb 1977) was indeed a very sad event. Many of us wept. The mortal remains were kept for public viewing and thousands came to pay floral homage to it. Triplicane cried on that day and thousands accompanied the funeral cart. Have seen the exhibition of relationship between temple at KachiVaradarajaperumal temple and aSrivaishnavaite called ‘aanaikannan’ both enjoying a mutually great relationship – there are legends of the elephant once turning wild, running amok inside the temple, none able to enter for a day or so, collector issuing a shooting order but this Kannan bringing the elephant under control, without any equipment or hurting the pachyderm. 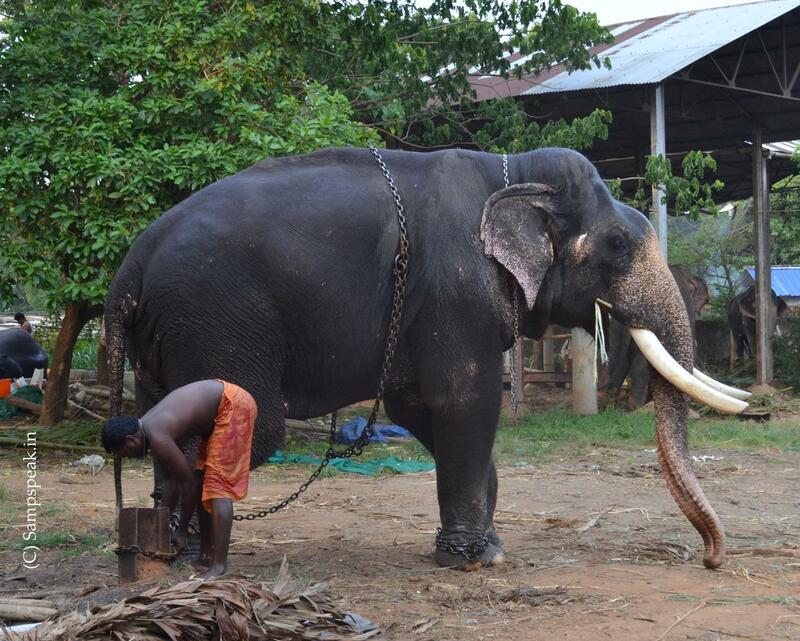 ~a majestic tusker of Thrissur Vadakkunathar temple. Misfortunes can occur at any workplace harming those at work. Duty is cast on the Employer to pay compensation arising out of personal injury / death caused to a workman at such workplace. Employees Compensation Act [Workmen Compensation Act 1923 earlier] – provides for payment of compensation by the employer to his employees (or their dependents in the event of fatal accidents) in respect of personal injury due to accidents arising out of and in the course of their employment. The beneficialenactment aims not at compensating the workmen the wages, but provides for compensation for the injury or death. The amount of compensation depends on the nature of the injury and the average monthly wages and age of workmen. Here is an interesting case decided by High Court of Kerala that dealt on various aspects of WC – on who would fall within the purview of the act, what constitutes workplace and how liability passes on to the Insurer. First the desktop Underwriter needs to come out of the stereotype – the workplace need not be a posh Office or a factory – it can be elsewhere too. It was an appeal filed by a PSU Insurer against the victim and his employer, who was the policy holder. The appellant (Insurer) challenged the jurisdiction of the Commissioner for Workmen's Compensation to pass an order allowing recovery from the appellant, the compensation awarded to the workman, the first respondent. The fact of the case was the respondent here (applicant before labourcommissioner) was working as a mahout of the elephant by name "Dhananjaya" owned by the second respondent. On 28.3.1998, while the applicant was engaged in his work as a mahout at a festival of Maniyoor Temple, he fell down while he was getting down from the top of the elephant as he was kicked by the elephant.The applicant sustained injuries and was treated as an inpatient in the Medical College Hospital, Kozhikode. He had to undergo a surgery, as he sustained fracture of his right femur. Medical College Hospital, Kozhikode certified that the applicant sustained disablement and it was assessed at 30%. A sum of Rs.2 lakhs was claimed by the applicant as compensation. The employer, who is the owner of the elephant, as well as the insurance company were made opposite parties before the Commissioner. The Commissioner found, on evidence, that the applicant is entitled to compensation of Rs.45,494.40. The insurance company was arraigned as one of the opposite parties on the ground of Insurance Policy. The insurance company contended in the written statement that since no policy was issued indemnifying the employer under the Workmen's Compensation Act, the insurance company is not liable to pay compensation.The Commissioner found that policy (exhibit) covers the claim for compensation by the mahout under the Workmen's Compensation Act and, therefore, held that insurance company is liable to pay the amount of compensation.Learned counsel for the appellant contended that the Commissioner has no jurisdiction to fix the liability on the insurance company. In WC Insurance (Policy coverage) there exists no such denial – a policy in force covering the employer, employer becoming liable arising out of an accident during and in the course of employment – certain liability – but the difference here was it was not a WC Policy but a Policy intended for the protection of the elephant. The Policy did not provide coverage against claim for compensation for the injury sustained by the employee during the course of employment. It was also brought on record that WC policies would not have a sum insured but the policy covering the elephant had one. It was contended by the Insurer that remedy, if any, of the mahout is to approach the civil court. The Counsel for 1st respondent (victim mahout) contended that there is no such distinction in the policy. The employer is liable and so, the Insurer too. He also relied on the decisions in New India Assurance Co. Ltd. V. R.Shridhara and another (1991 ACJ204) and United India Insurance Co. Ltd. V.Vasudevan (1989(1) KLT 366(F.B.)). The policy filed as exhibit shows that the certificate of insurance is issued "for the insurance of elephant for the members of All Kerala Elephant Owners' Association". As against the column "Name of the insured", it is mentioned as "All Kerala Elephant Owner's Association" and "K.GovindanChettiar". The period of insurance is from 19.6.1997 to 18.6.1998.Name of the elephant and the description of the elephant are shown in the policy. As against the column "purpose for which used", it is recorded as "temple and timber". The total sum assured is Rs.4 lakhs. Under the head "third party liability cover", there is a column as "mahout coverage" and under the head "name of the mahout", it is recorded as "2 unnamed mahouts". The policy followed an agreement executed between All Kerala Elephant Owners' Association and the insurance company, termed as "master policy agreement for group elephant insurance scheme. It specifies "third party liability" and there is "mahout cover" as well. The Assistant Divisional Manager of the Company, who was examined as RW1, admitted in evidence that the policy was given for covering personal accident injury and death of two mahouts employed by GovindanChettiar and that the mahouts are insured for a sum of Rs.2 lakhs each. He also stated in evidence that the policy in question covers injuries sustained by mahouts due to attack made by the elephant. (ii) employed in any such capacity as is specified in Schedule II, whether the contract of employment was made before or after the passing of this Act and whether such contract is expressed or implied, oral or in writing; but does not include any person working in the capacity of a member of the Armed Forces of the Union; and any reference to a workman who has been injured shall, where the workman is dead, include a reference to his dependants or any of them." (xxii) employed in the training, keeping or working of elephants or wild animals;"A mahout is certainly a person who comes under the category mentioned in entry (xxii) of Schedule II of the Act. The Chambers Dictionary defines mahout as "the keeper and driver of an elephant". Webster's New Dictionary and Thesaurus gives the meaning of mahout as "elephant driver". The scheme of the Act is that the Commissioner has to decide the question as to the liability of any person to pay compensation and no civil court shall have jurisdiction to settle, decide or deal with any question which is required to be settled, decided or dealt with by the Commissioner. If the workman institutes a suit for damages, he is not entitled to file an application under the Workmen's Compensation Act. If a workman has instituted a claim for compensation before the Commissioner, he is not entitled to institute a suit for damages. This provision provides for the election of the forum by the workman. It does not provide for a defence for the employer to contend that the workman should have resorted to the remedy which he has not resorted to. The option lies with the workman and not with the employer. It was held by the Honble High Court that the contention of the Insurer that the Commissioner has no jurisdiction to direct recovery of the amount of compensation from the insurer, was not accepted. The Court further held that the contention of the appellant that their policy does not cover the claim for compensation by mahout and also that a group insurance policy cannot be availed of by an individual workman in respect of the injury sustained by him, is also without substance. It was held that going by the terms of the policy read along with the agreement – it was clear that the Insurer is liable to compensate the insured in respect of the personal injury sustained by the mahout in the course of his employment under the insured as a mahout. Whether it is a group insurance or individual insurance, it does not affect the coverage and the insurer is not entitled to dispute its liability on the ground that it is a group insurance. The purpose of insurance is clear from the agreement. Whether the All Kerala Elephant Owners' Association approached the insurance Company or whether the individual owner of the elephant approached the insurance Company for insurance coverage is not at all relevant in fixing the liability of the insurance company as an insurer. The question is whether insurance company is liable at all, in terms of the policy. Such liability is not dependent on whether it is individual policy or group policy. The nomenclature of an insurance policy is not always decisive and the rights conferred on the workmen under the Workmen's Compensation Act cannot be taken away by the nomenclature of an insurance policy.In New India Assurance Co. Ltd. V. R.Shridhara and another : 1991 ACJ 204, the Karnataka High Court considered a similar question and held thus:"That the insurance company has different types of policies including the one under the provisions of the Workmen's Compensation Act, is not a defence to absolve itself from paying under the miscellaneous group insurance as in the instant case. That will be helping technical defence which this Court will not countenance." The Kerala Court held that they are in agreement with the view taken by the Karnataka High Court and held that the contention of the appellant that impugned policy is not sufficient to cover the claim for compensation for the injury sustained by the mahout in the course of his employment, is unsustainable. The appeal was dismissed with costs. Not sure whether Insurers agitated further or accepted liability as the quantum was not big enough to challenge though it might appear that they have been called upon to pay under a Policy intended to cover elephant and additionally injuries to mahout. This policy certainly was not intended to cover the employer’s liability, yet, the Insurers lost their cause – may be for reasons that their defence was not strong or the facts were not well – presented. Interesting indeed and offers so much learning for the Insurer as also others who read this judgement. giant leaf for mankind ~ cotton sprouts in moon ! impertinent Hardik Pandya banned ! 'hath ka bana' greetings makes me Happy ! Sydney stands between famous Indian win !! Maybach on road ... some history of Mercedes !! Gatwick drone chaos ! airport sold to Vinci ! !